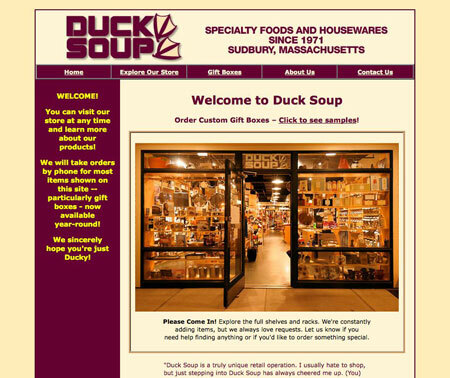 Duck Soup is not just a client, they are a favorite store to visit... for great gourmet cooking items and cheese and coffee, but also the great warm cheer from the people. They are wonderful. Now, capturing that on the Web site was a challenge. When we first met in 2000, the historic mill building that housed the store had just burned to the ground in a spectacular new year's blaze. The Web site was first set up to sell coffee thru a small office in which they set up "shop." We helped track the progress of the rapid rebuilding effort and have been helping with the Web site and advertising and other needs since. Also, the domain is not what you think... it's www.quackquackquack.com!